The Amateur Anthecologist: The Narcissus Cometh! Small cupped Narcissus hybrid close to the town proper on the side of the road. I'm not sure what has happened to the tepals here, but the translucence gives them an ethereal quality. These small flowers (about an inch and a half in diameter) stood out on my commute home. The salmony-orange color stands out, even going 45mph. I have watched as Narcissus around the neighborhood have opened, some weeks ago. Perhaps because of the extra shade, properties of the soil, or minor increase in elevation, mine will always open later than those closer to town. This (above and below) is the first one to open. Taken in the morning and afternoon on the same day, you can see how fast they progress. However, Narcissus have evolved to deal with pollinator limitation (not so many pollinators active this early in the year) by having a long bloom period, around two weeks. I'm not exactly sure how long the stigma remains receptive. The pollen is susceptible to mechanical damage (rain could wash it away), but the flowers of most are somewhat pendant, which helps. You can see above the six anthers surrounding the stigma. The presence of all the stamens within the corona (the cup or trumpet) indicates this type is better suited to bee pollination. In the Iberian Peninsula and surrounding the Mediterranean where many Narcissus originate, bees of various types are the pollinators of this general form. If , however, the stigmas were partially constricted in the flower tube (the thin part behind the tepals), that would indicate moth or butterfly pollination, bees morphologically unable to functionally pollinate the flowers, meaning they wouldn't fit. This is the case with many tazetta and jonquil type forms, such as Narcissus tazetta, or paperwhites. The types of Narcissus typically called 'daffodils' have unique properties, or at least the wild forms do. A study revealed a greenhouse effect created by the corona, or trumpet, of a particular species. Inside was discovered to be warmer than ambient air temperatures outside, particularly closest to the anthers. This adaptation entices solitary bees, Anthophora sp. in Europe, to enter the flowers. Honeybees are rarely active this early, except when the temperatures reach a threshold of around 55° F. Bumblebees, however, can fly at cooler temperatures by vibrating their flight muscles while not in flight to stay warm. That may be why I have only ever seen bumblebees attracted to Narcissus. The backside of this daffodil is equally interesting, with slight green stripes and a mild tessellation if you look closely at the expanded image. 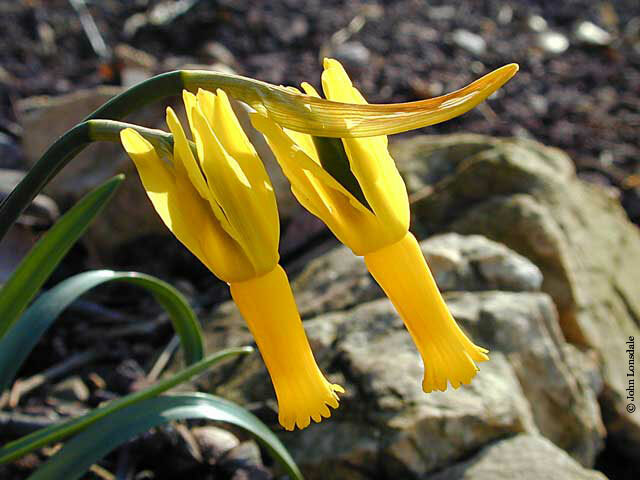 The worlds most grown Narcissus, a hybrid of Narcissus cyclamineus, is one of the easiest to grow. It is reliable, early, and tolerates things other plants would reject outright. Small flowers such as this, less than eight inches, are always worth tilting up for a closer look. It is good to remind yourself that the purpose of flowers is not just beauty but rather for reproduction, so go forth and appreciate the reproductive parts. They often offer as many interesting surprises in flowers as the more obvious parts.